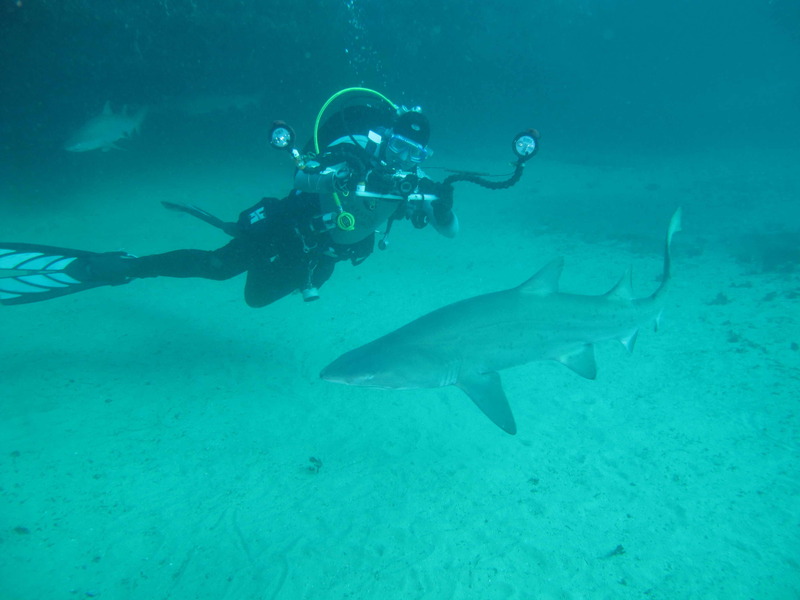 Magic Point is a unique place where you can swim with Grey Nurse Sharks. We have seen as few as 3 and as many as 11 on our dives there. The location is a small cave at the bottom of a wall south of Maroubra. The cave itself is at a depth of 15 metres. It has a flat sandy bottom out in front of the cave, going out about 8 metres, is a nice sandy bottom that you can carefully rest on or float above. Be careful not to stir up the sand as the viz will go very poor quite quickly. It is well described by Michael McFadyen on his Magic Point web page. If you keep still for long enough the sharks will get curious and come quite close - within a metre. While the sharks aren't aggressive they should be treated with the respect any wild animal deserves. Keep put of their way and don't block them in. Magic Point can be done from shore (it's a very long hard walk in dive gear) but is best as a boat dive. Several charters regularly go to Magic Point, usually organised through various dive shops . Plunge Diving runs regular charters out of Chowder Bay. Check out dive shop web sites for details. Beyond the cave to the East is another cave and there is often interesting creatures in the waters in front of the cave out to a depth of around 22m. GPS co-ordinates we use are: WGS84 GPS. 33° 57.390' S 151° 15.918' E. This puts the boat just East of the cave in around 20m depth. Click on the links below to go to specific pages. I also have video of the GNS at Magic Point. E-mail me for details.